The Cancun Convention & Visitors Bureau (CVB) has announced the inauguration of the Sea Walls: Murals for Oceans project in Isla Mujeres, opened to the public on July 27. Sea Walls consists of a series of 15 large-scale murals created by some of the top names in contemporary street art. This project was organized by PangeaSeed, an international organization that raises public awareness for the conservation of sharks and other marine species. This installation is presented in collaboration with 1xRUN, Residencia Gorila, World Art Destinations, Juxtapoz Latin America and Mapla, and is the organization’s largest project to date. The Sea Walls murals can be found in Downtown Isla Mujeres – making it easy for tourists and locals to take in each artist’s piece while on a leisurely stroll. 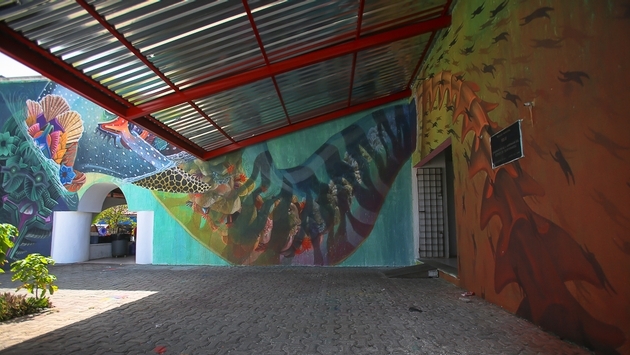 The murals all depict a whale shark and/or stingray, and each carries the distinctive technique and style of each artist. As part of their preparation for this project, collaborating artists had the opportunity to swim and study manta rays and whale sharks. “From May – September, when whale sharks migrate to the coasts of Cancun and Isla Mujeres, they are more abundant here than any other place on Earth. Isla Mujeres was the perfect location for PangeaSeed to host their latest and largest mural project,” said Jesus Almaguer, CEO of the Cancun CVB.